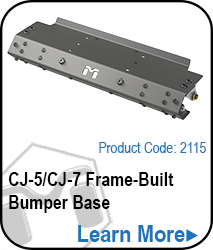 The Hi-Mount Stinger for the CJ Frame-Built bumper provides the rugged protection you need with strong lines and a rock-crawler's confidence. Designed to go with our Hi-Mount Shackle Kit (2131), the MetalCloak stinger is ready to play when you are. Note: All CJ Hoops come with weld on shackles.